Of all the iconic Joes in food history (Joe of Joe’s Crab Shack, Joe of Joe’s Pizza, and, of course, Trader Joe), few are more mysterious than the Joe behind the Sloppy Joe. The sandwich—essentially a sauced, shapeless, loose meat hamburger—was probably a staple of your childhood. Not mine. My introduction to the Sloppy Joe came from one of the lesser-known Mary-Kate and Ashley Olsen oeuvre: the 1995 cinematic feature It Takes Two. Mary-Kate’s character eats a Sloppy Joe for the first time, and not knowing the name, simply refers to it as a “big, gooey, messy burger.” I was a vegetarian at the time, but as soon as I saw Mary-Kate bite into that Sloppy Joe, her prepubescent hands stained with sauce, lumps of ground beef spilling out of the bun, it was enough to break me from my meatless spell. I wanted one. This is the feeling the Sloppy Joe inspires in its devotees: I don’t quite understand why, but I definitely need to be eating that right now. The desire is shapeless, mysterious, overwhelming. But back to Joe. Who is he, exactly? There are two theories. One day, seeking to add food to complement the drinks on the menu (the bar popularized the mojito), he put together a simple sandwich filled with ground beef stewed in tomatoes. It’s likely he was influenced by ropa vieja, a Cuban dish of shredded beef with tomatoes and spices, as well as picadillo, a comfort food of ground beef mixed with capers, olives, and raisins. The second theory is that the Sloppy Joe—in all of its moist, meaty, brick red glory—is a product of the Midwest: specifically, Sioux City, Iowa. Loose meat sandwiches—a Sloppy Joe without the slop—are said to have originated around the ’20s, when home cooks were looking for dishes that were economical yet filling. Ground beef was a perfect solution. Dave Higgins of Ye Olde Tavern claims its invention in 1924. Another restaurant, Maid-Rite, in Muscatine, Iowa, also claims ownership, albeit two years later. The restaurant franchised throughout the 1930s, and as the theory goes, a cook named Joe at the location in Sioux City came up with the idea of mixing in tomato sauce to the ground beef, thus creating the Sloppy Joe. Regardless of how the Sloppy Joe came to be, we know that throughout the 20th century, its popularity skyrocketed. Countless American cookbooks from the ’40s through the ’70s feature recipes for the dish. 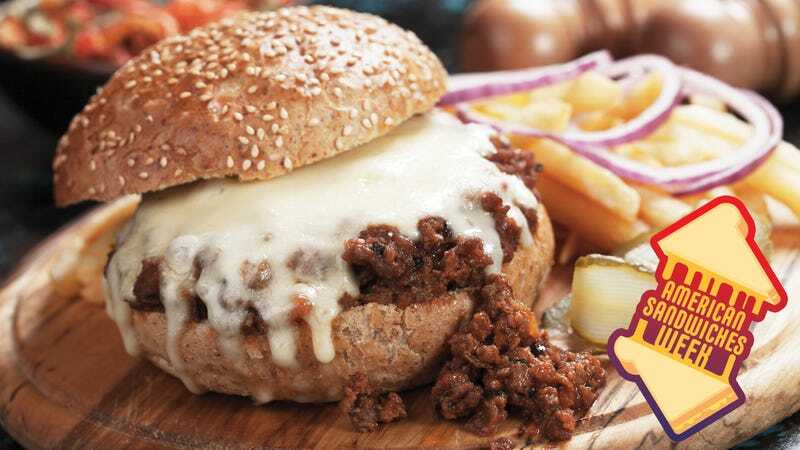 In 1969, mankind was gifted with the Manwich, a canned Sloppy Joe sauce with a guess-it-wasn’t-sexist-in-the-’60s slogan: “A sandwich is a sandwich, but a Manwich is a meal.” The Manwich was an immediate hit, thanks to its branding as an easy, one-pan meal for the whole family, catapulting the Sloppy Joe into mainstream American food culture. The Sloppy Joe developed different names in various corners of the country: “Sloppy Jane” in central Minnesota, “Wimpies” in northern Pennsylvania, “Spanish hamburgers” in parts of Wisconsin, to name a few. We achieved the Sloppy Joe pop culture total eclipse in the ’90s when the dish was featured on Roseanne as the specialty of the restaurant the Conners eventually open. Today, the Sloppy Joe has seemingly become a relic in a time of more vogue, Instant Pot-able, sexier dishes. I rarely encounter it in cookbooks (although the recipe is so simple it can be explained in a tweet). But what’s unique about the Sloppy Joe is how impervious it has been to permutations or updates. Restaurants have found ways to fancify humble dishes, like adding truffled aioli to grilled cheese, or replacing hamburger buns with ramen noodles. The Sloppy Joe, though, is unyielding. People have accepted that what’s great about the dish is not the potential for modifications, but its stupid simplicity: a squishy white bun, some ground beef, tomatoes (or ketchup), and nothing else. The Sloppy Joe may have entered the world with conflicting narratives, but it arrived fully formed.